From scenic delights to famous racing events, luxury personified to fine dining and plenty of fun and adventure thrown in for good measure, Phillip Island in Victoria's eastern region is an island loaded with plenty of things to see and do. 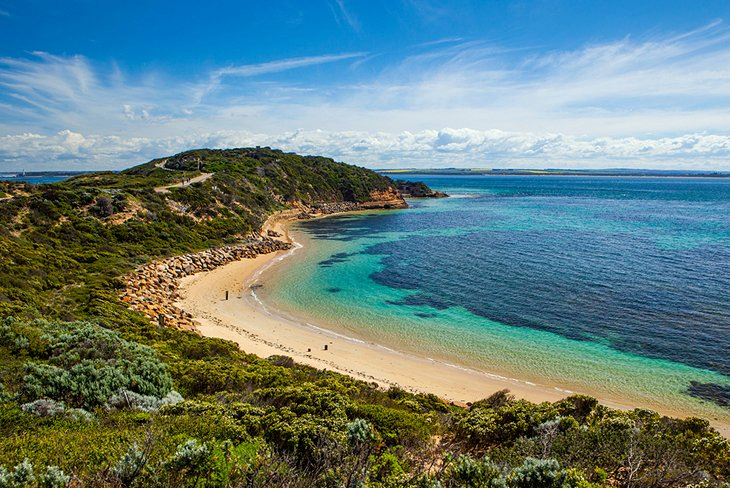 Phillip Island is ideal for a family break by the sea, a winter escape to cosy up with your loved one, adventure seekers paradise with plenty to get the blood pumping and a haven for lovers of nature and wildlife as Phillip Island is known as the Galapagos Island of Australia. Located around 140 kilometres from Melbourne, Phillip Island is easily accessible for the ultimate getaway! Watch the daily procession of the famous penguin parade; grab a spot on the hill to watch the Phillip Island Grand Prix every October or join one of the many tours to experience the variety of wildlife that calls this island home. From your accommodation that you book onto Phillip Island whether it be a self contained apartment, hotel, bed and breakfast, caravan park, cabin, cottage or holiday house by the sea, just to name a few, you will never be far from all of the action. Enjoy the pristine beaches, cruises and charters, spend your days exploring the stunning coastline and cycling tracks around the island, sample some of the wine made at the local wineries or indulge your taste buds with some sumptuous dining from breakfast, lunch or dinner in a variety of cafes, eateries, take away outlets, al fresco restaurants and fine dining establishments. Phillip Island is a holiday destination where you can explore deep caves and go caving for something really exciting, join a helicopter ride for views from up above, go horse riding or soak up the history and heritage of the island within the National Vietnam Veterans Museum that dates back to the Vietnam War. You can do hot laps in a racing car, enjoy go karting and ten pin bowling, have a picnic in beautiful landscape gardens and parklands, walk through the Koala Conservation Park, Wildlife parks and enjoy countless walking tracks where you will get up close and personal with a variety of animal. From water fun and exploring the land there are so many wonderful attractions and activities that you can fill up your days with while holiday on Philip Island. Browse through the small towns on the island where you will find plenty of interesting retail shops and outlets, dine in top notch restaurants for lunch and cap off the day with an afternoon at the beach with the kids. Phillip Island can be your romantic getaway, ideal location for the perfect wedding, venue for a corporate gathering or meeting, destination for the ultimate holiday with the kids or honeymooner’s paradise as it is an island loaded with extras. No matter the type of holiday you wish to enjoy, what you want to experience and discover, the type of holiday accommodation you wish to stay in and how much you are willing to spend, Phillip Island is ideal for all types of vacations. Bounding in scenic delights, endless amounts of wildlife, action, adventure, family fun, plenty of day and night entertainment, beautiful beaches and numerous tours and events to fill up your days with while holidaying here, it will be hard to find anywhere else that beats Phillip Island. Discover a small slice of paradise off the coast of Victoria that is easily accessible by travelling over the connecting bridge from the mainland and find a spot that still remains barely untouched from the outside world and large developments.